The Green Line extension appears to be moving back to the front page and is part of an infrastructure initiative put forward by the Trump administration. 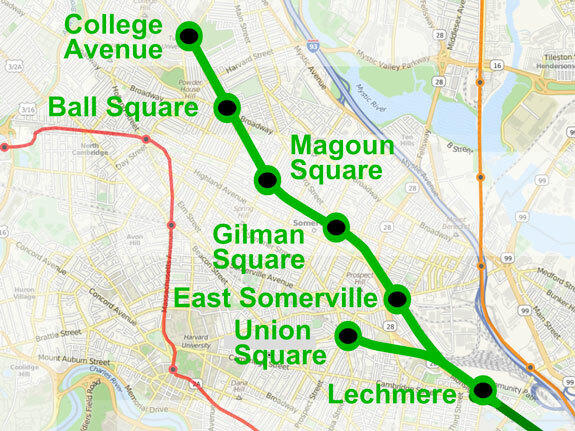 The Green Line Extension (sometimes abbreviated as GLX) is an initiative to expand transit services in Greater Boston by extending the Massachusetts Bay Transportation Authority (MBTA) Green Linelight rail beyond its current northern terminus at Lechmere Station in Cambridge, Massachusetts. The 4.3-mile (6.9 km) extension is intended in order to improve mobility and regional access for residents in the densely populated municipalities of Somerville and Medford, two cities currently underserved by the MBTA relative to their population densities, commercial importance, and proximity to Boston.